The Heritage Lottery Fund released 20 Years in 12 Places: 20 years of Lottery funding for Heritage Lottery Fund this morning. Major attractions and parks have the highest levels of awareness and engagement. Parks have the greatest impact on residents quality of life. 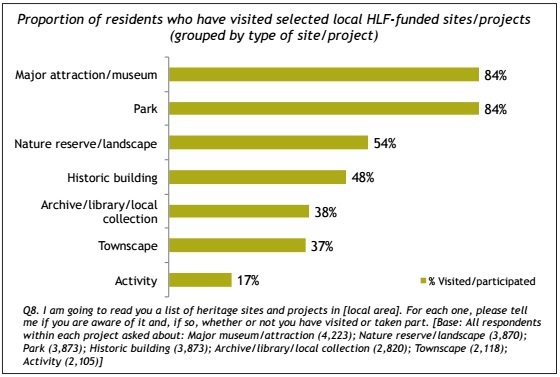 To coincide with 20 years of investment into the UK’s heritage amounting to over £6billion, the Heritage Lottery Fund (HLF) commissioned Britain Thinks to conduct in-depth research in 12 towns and cities representative of the UK population. The aim was to better understand the public’s view of that National Lottery investment and to see to what extent it had made places better to live and work in or visit. The full ’20 years in 12 places’ report and media release are available on the Heritage Lottery Fund’s Press Releases section.